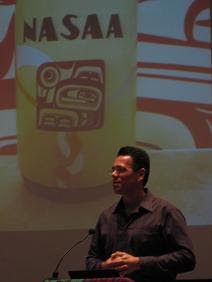 I attended the 2nd day of the annual Native American Students in Advanced Academia (NASAA) Symposium today. The audience was educated, informed, and inspired throughout and it made me decide I wanted to quit working and just attend conferences for the rest of my life. I wish! The students that presented were doing incredible work and the keynote speakers, Dr. Robert Warrior and Dr. Taiaiake Alfred were amazing as well. Best of all, I got to hear my friend Deborah Guerrero sing one of the opening blessings.